nautical miles across the Atlantic ocean. These days, Helmut and his friend, Andrea Schwaighofer, are planning cruises aboard "Viva" around the Mediterranean, with stops in Spain, Italy and Tunisia. 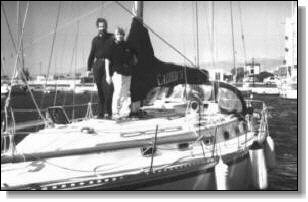 "Andrea and I launched "Viva" in December 1991 in Palmetto, Florida, and sailed her down to Key West and around to the Bahamas. After a short stay on Green Turtle Cay, we headed for Bermuda in May 1992. Uncommon weather patterns made the 800-nm trip exciting and fast, taking six days at an average speed of 5.7 knots. From Bermuda, we planned to head for the Mediterranean with a stopover in the Azores, but the irregular winds allowed no easterly course. We headed north for six days, mostly in 20 to 25-knot easterly winds. Because I had to get back to my office in Munich, we finally had to abandon our course and sail to Newport, RI. From there, Andrea set out in July aboard "Viva" along with Jim Stanek, a professional skipper. During the 2,000-nm trip to the Azores, "Viva" had to cope with hard conditions in the North Atlantic, including winds of up to 45 knots, and severe and frightening thunderstorms. The trip took 13 days and 16 hours, at an average speed of more than six knots -- a very fast passage for a 38-foot cruising boat. I joined up with Andrea in Horta for the third and final part of "Viva’s" voyage, another 1,200 nm to Portugal, Gibraltar and Spain. This included an exciting mixture of all kinds of weather conditions: strong head winds up to 45 knots, but some rare, nice downwind courses, too.